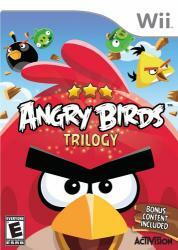 Angry Birds is now crashing in on the Wii and Wii U systems�gather your flock and sling into action! Completely remastered for the big screen with crisp, amazing new graphics, Angry Birds Trilogy migrates to Wii and Wii U consoles with new, hilarious animated cinematics. Get the original Angry Birds, Angry Birds Rio, and Angry Birds Seasons, plus hours of added built-in levels, and access to even more�over 260 levels of downloadable content�for nonstop slingshot Angry Bird action.